Last year, I randomly bumped into you at the lunch spot in Cache Creek. It's been 10 years since I left Chilcotin Holidays, where I spent 3 summers as a Wilderness Guide, and had some of the most amazing experiences of my life. So for these wonderful memories, I would like to thank you, Kevan, for allowing me to learn what hard work really means, and how to show great western hospitality to guests from around the world. "I feel happy yet sad at the same time. I want to be here and there at the same time. I feel equipped, yet unequipped. My name is Robin. I have hurt others and have been hurt by others. I want to ameliorate. But how? I loved my wilderness guide job yet didn't feel 100% satisfied with it. I really grew throughout the 2005 season. I went from kitchen helper/cleaning girl to lead guide. I know the Eldorado area well now. Just thinking about that vast place brings tears to my eyes. I can't imagine not knowing it. And so many people don't. Like I hadn't, they have no clue that such a place exists. A place that takes only 7 hours to get to by horse. A place where you can be you. This is the place where I have watched a lone wolf traverse across the meadow, 53 mountain goats sunbathe on an ice pack, a mother grizzly and 3 cubs play, undisturbed by my presence. I am only 18 years old and my job includes guiding a group of foreign tourists through the wilderness, past the wildlife and into a whole new world. With bear spray around my waist and a 12 gauge in the scabbard, I am safe. I fear not the animals, nor the weather, nor people. I watch the stars poke through the dark sky as I stoke the fire. Horses jingle as they hobble around, feeding on the lush vegetation surrounding the solitude camp. This is my home and it makes me free. 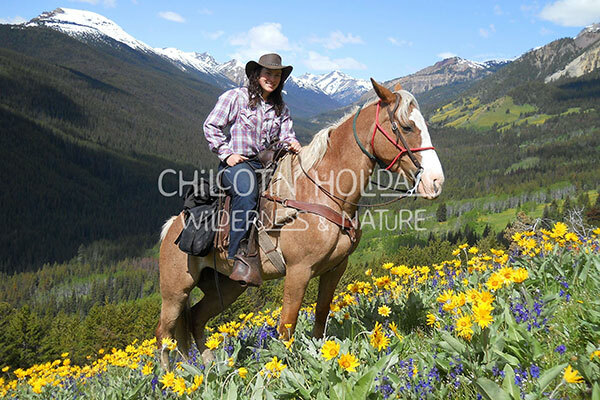 Thank you Chilcotin Holidays for giving me this awesome opportunity to grow and explore. I have learned a lot, yet have just begun on the long and beautiful journey that lies before me. " I live in Quesnel BC again, my home town. I often wonder when I'll go back to revisit those gorgeous Chilcotin mountains (on my own horse!). Well that got lengthy, but I think it was time I made known my gratitude for what I was given; the chance to experience true wilderness. Hope things are going well back at the Ranch and you have a great 2017 season.